The Truman men’s basketball team closed its 2012-13 season with a 10-17 overall record, qualifying for the MIAA tournament for the first time since the 2006-07 season before falling in the first round at Pittsburg (Kan.) State. Three Bulldogs earned MIAA honors, headlined by a third-team all-MIAA award for junior forward Mike Carlson and honorable-mention accolades for senior guard Tom Norton and sophomore guard Seth Jackson. The Bulldogs improved on last season’s win total and won the most games by a Truman squad since the 2006-07 season (16). In addition, the Bulldogs won more road games this season (5) than the last four years combined (4) and tied the most in a single-season since 2006-07. The Bulldogs also won more MIAA regular season games this year (7) than any since 2006-07 (9), despite playing two fewer games. Truman finished the season ranked in the top third of the MIAA in three-pointers made per game (7.5), free throw percentage (72.8 percent) and assist-to-turnover ratio (1.1). Tom Norton shoots the ball at a home game. On an individual level, Carlson led the squad by averaging 17.1 points and 6.7 rebounds per game and ranked in the MIAA’s top 10 in scoring, free throw percentage, steals, blocked shots and defensive rebounding. 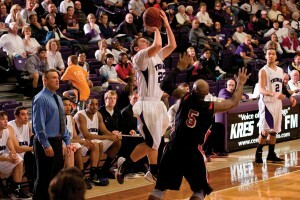 Norton, meanwhile, led the MIAA in free throw percentage (89.5 percent) and in three-pointers per game (2.8). 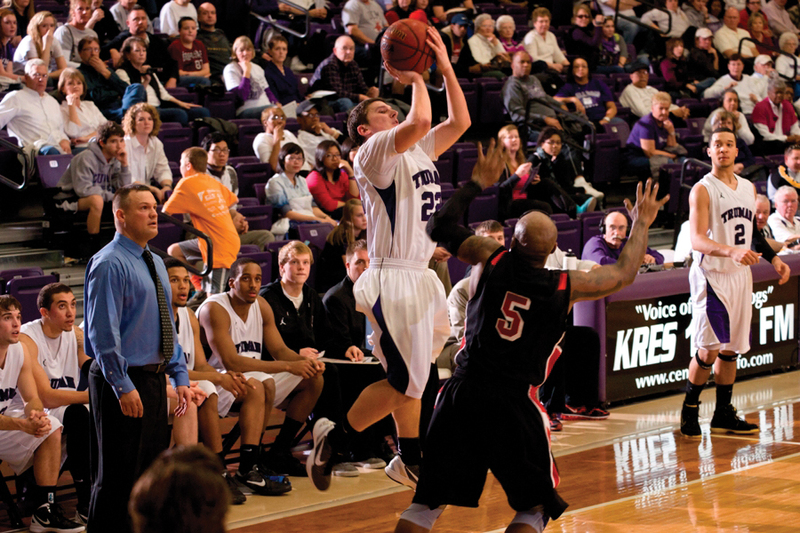 In addition, he became Truman’s all-time free throw leader by closing his career with an 85.8 percent clip from the charity stripe and finished 16th on the all-time scoring chart at 1,114. Highlights throughout the season included a 57-point victory against Central Christian (Mo. ), an MIAA-opening road win at Missouri Western, an eight-point road victory at 10th-ranked Washburn (Kan.), a one-point home win against Nebraska-Kearney in which Norton hit nine three-pointers, and an eight-point win at Northwest Missouri to close the regular season in which the Bulldogs trailed by 18 points with 15 minutes to play in the game. This was the second season under Head Coach Matt Woodley, as the Bulldogs graduated seniors Norton and Matt Patterson while returning four starters for the 2013-14 season.